It is alive and living! That's what makes it so wonderful! Most of us know that foods that are alive, growing and raw, keep our bodies vibrant. Like eating a peach as soon as you pick it from the tree. Or eating a tomato fresh out of the garden. These are the sweet joys of nature! And this is exactly what your baby is getting every time she drinks your milk....pure, raw goodness that's alive. Storing breast milk is extremely simple. Now, with those two things in mind, remember that everything you read about storing breast milk are guidelines to follow, not the rules. So when you get ready to feed your baby your stored milk, imagine that it is your favorite food item. Put it in the same situation as that milk, and ask yourself if you would still eat it. If your favorite food was sitting in a scorching hot car all day while you were at work, would you still eat it? If you found a piece of your favorite pie wrapped in plastic, in the back of the freezer after two years, would you still eat it? Use your common sense along with these guidelines when feeding your baby stored breast milk. Make sure your hands, bottles and pumping devices are clean. You wouldn't cook dinner for guests with dirty hands and utensils would you? Hopefully not. Your baby is the Guest of Honor. breast milk storage bag after writing the date on the bag. You can pour a little or a lot of milk in your storage bag or bottle, but leave some room at the top for expansion just in case you need to freeze it. Squeeze the air out at the top of the storage bag before closing. Then put it in the refrigerator for later. That's it! Two steps. Simple huh? If you want to add fresh pumped breast milk to refrigerated or cold breast milk, let the fresh milk cool first and then add it. If your baby wants to eat now and the cold milk is not enough, go ahead and mix it together....you're baby won't die. I've done it several times and all of my kids are pretty healthy and strong. It didn't hurt them. If you're storing breast milk while at work, store the milk in a cool area, maybe a refrigerator or cooler. Most breastpumps come with some type of cooling device in them. Remember, you can always leave your milk out at room temperature for about 8 hours, so if it feels pretty good inside your work building, you can put your milk in a large bag, your purse, or backpack. If you drive to work and it's cold outside, storing breast milk in the car will keep it cool. Your breast milk is not pasteurized, which means it's extremely good, with all the good bacteria and enzymes still there. This also means that your milk will separate if it sits for awhile. There will be a fatty creamy layer on the top and the rest will seem like water. Your milk is still good. Do not throw it away. Just shake the bottle up or mix the milk around in the bag before giving it to your baby. 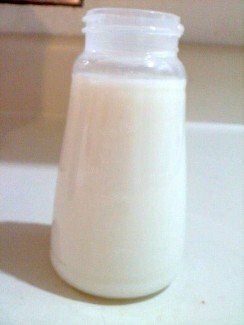 If your milk has been sitting at room temperature, the only thing you or the babysitter need to do is pour it in a bottle if it's in a storage bag. If it is already in a bottle, just use it. If your milk is cold, leave it in the storage bag or pour it in a bottle, whichever way you choose, and put the bag or bottle in a bowl or cup of warm water or put it under running warm water only. Once warmed, feed it to your baby. Do not microwave your breast milk. Make sure your babysitter knows this. Remember, your milk is alive, and microwaving it will kill a lot of the good stuff that's in it. When I pick my baby up from his great-grandparents house and he still has a half of bottle of milk left, I mix it with the fresh pumped milk and refrigerate it to use for the next day. If I don't use it within 7 days, I go ahead and freeze it. If you want to keep your used milk for later, make sure your babysitter knows not to throw it away. With my first kid, the babysitter was throwing the left over milk away after I would pick my son up after work. She did this for months before I found out by hearing her one day say, "let me pour this milk out". I asked her if she always did that and her reply was yes. I just thought my baby was drinking a lot of milk! I didn't know she was throwing it away! After letting her know not to throw it away, I was able to save more milk in the freezer for my baby to use later. Let your babysitters know, because a lot of them are not used to dealing with breast milk....formula is the norm for them. And that's how you store breast milk and feed it to your baby. If you remember that breast milk is alive, and ask yourself if you would still eat it after certain situations if it was your food, you will get the hang of storing breast milk fast!